Last night RCH/Soaring Eagle/Jimmy John’s Suzuki announced what we knew was coming—Ken Roczen’s ankle injury is going to keep him out of a few races and eliminate him as a title contender. After consulting with RCH team owners Carey Hart and Ricky Carmichael, Ken Roczen will sit out the next three weeks after aggravating an ankle injury sustained in Atlanta. Roczen re-injured the ankle in practice at Daytona and would sit out the night. Roczen, who has two race wins in 2015, is currently fourth in 450SX points. Here’s what two of our staffers think about the news. Jason Weigandt: A 20-year-old in only his second year as a full-time premier class rider on a new team usually doesn’t make for a championship favorite, but Ken Roczen is different. He’s proved to be a fast learner and also not prone to the crashes and inconsistencies that usually plague young riders. Proof? Ken had never missed a supercross race due to injury until Daytona, making every scheduled appearance in the Lites class from 2011-2013 and every 450SX main event last year (he did have to switch from Lites West to Lites East in 2012 due to an arm injury, he missed one race in 2011 due to a schedule conflict with the GPs, and he notoriously failed to qualify for the Salt Lake City race in 2013). His outdoor record is even more amazing, having made all thirty-six Lucas Oil Pro Motocross Championship nationals he’s been scheduled for, and forty-one straight GP starts before he moved here. So that’s seventy- seven straight motocross races without a miss, and fifty-two straight supercross starts, a grand total of 129 straight without injury until he missed Daytona. So I’m still surprised by all of this, and I’m sure it’s disappointing to Ken, his fans, and his team. But some of the news we’ve gotten is slightly encouraging. Insiders tell me Ken actually first hurt this ankle in that Oakland mega case, which explains why he’s gone winless since. The Atlanta problems only made it worse. So, at least we know why Ken slipped from his form at the first three races. We were hearing all kinds of stuff, but mainly how leaving Aldon Baker’s training program had made an impact. Turns out Kenny hasn’t been 100 percent for awhile now. Can you imagine if he had won Oakland and took three of the first four? This thing could have been much different. Now it’s just over for him. Only for now, though. I think you’ll see Ken back for some more supercross this year. Steve Matthes: What a let-down for Ken and his RCH team. From going 1-2-1 at the first three races, to losing the points lead from crashes, to now being out with an injury. This has gone downhill fast. And it speaks, once again, to how hard it is to win a 450SX title in our sport. As Weege said, we found out that the Oakland case was where the ankle first became an issue. Think about that—him cutting under Chad Reed to take second place away was a nice move. Had he just checked up and went double/single, he would've stayed ahead of the #22 and there's no doubt he would've passed Andrew Short for the lead and taken another win. Instead he made a split-second decision to pin it and he hasn't been the same since. From what I hear this injury doesn't need surgery—just rest—and I'm glad that Roczen and the team have taken the steps to sit him out. 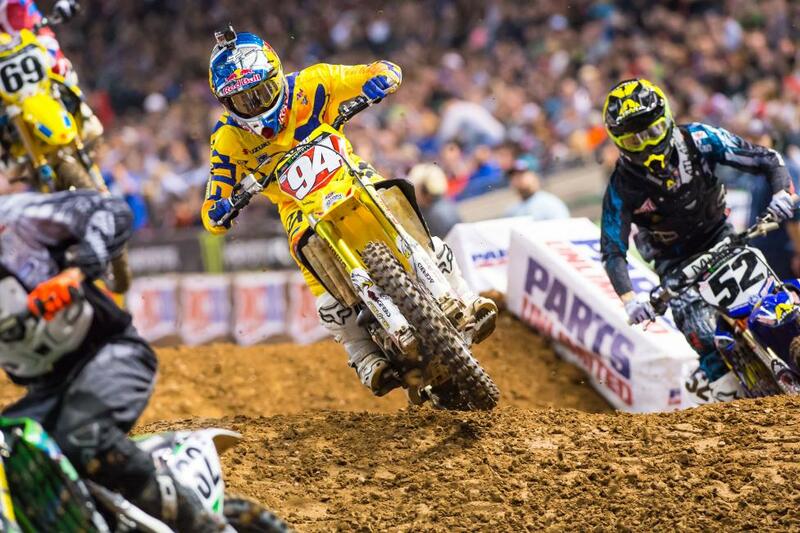 If I were the team I would think of benching the #94 for the rest of supercross. Sure he might be 100 percent in three to four weeks and catch the last three supercross races, but why bother? They have a 450MX title to defend here and have to try to salvage the season. I would bet this is a dark time for Kenny and his team, but let's not lose sight of the goal of getting a title, and the second one starts at Hangtown in two months.